Recall that in traditional offset litho printing, ‘AM screening’ is used in creating half-tones to reproduce photographic images. 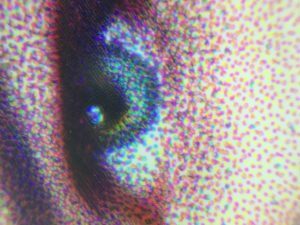 That is, variably-sized dots are produced by a high-resolution imagesetter (capable of creating laser dots at 2,450dpi, for example). A square dot might be made up by filling in from 1-100 pixels in a 10×10 pixel matrix, with each dot lying on a fixed-resolution grid of 245 lines/inch – the ‘screen ruling’. The screen dots are ‘amplitude modulated’ by the changing photographic image density, but their relative positions are fixed by the grid. The pitch or screen ruling is 245lpi, but the individual dot sizes vary from 1% (highlight) to 100% (shadow). A more recent printing development was ‘FM’ (or ‘stochastic’) screening, in which the variations in image density are reproduced by varying the distance between the dots – the frequency – rather than the dot size, which is kept fixed. The printer is effectively printing a collection of highlight dots, bunched closely together in the shadow areas of the image, and spread out in the lighter areas. This is how binary inkjet printing works too – the inkjet printer varies the positions of dots of fixed size to match the varying density of a photographic image, usually using an ‘error diffusion’ algorithm to place the dots. The dots on the paper are made by ink drops of a fixed size. Greyscale inkjet printing is like a combination of AM and FM screening – the dot size can be varied, by changing the drop volume, AND the relative positions of the dots is varied by the error diffusion algorithm. So now we can draw an analogy between traditional half-toning and inkjet: whereas a traditional (AM screened) image might use a 10×10 matrix of pixels to create screen dots of up to 100 grey levels (0-100% density), an inkjet RIP driving a printhead with, say, 9 grey levels can be thought of as using a matrix of 3×3 pixels for each dot, placed on a grid with dimensions equal to its advertised resolution. Hence the claim that the inkjet printer’s “apparent” or “effective” resolution is equal to the nozzle density multiplied by the square root of the number of grey levels. So our 360dpi, 9 grey level print engine can be said to have an “apparent resolution” of 3 x 360dpi = 1,080dpi, effectively matching the single-drop-sized 1,000di printer. The marketing person working for the greyscale printer manufacturer has a simple metric that matches the competition’s resolution claim, and she can justify it by citing Farrell and others, whose research shows that images reproduced by greyscale printers look better than images of the same resolution from binary printers. But there are a couple of important caveats – the first is the point already made: “apparent resolution” is subjective and unscientific, even though the analogy I just described gives it a fig leaf of theoretical justification. The second is more important – the concept of equivalent resolution applies only to continuous tone images. Although greyscale printing can reduce the staircasing (aka “aliasing”) visible in low-resolution line-art and text by filling in the stair-steps with smaller drops, the print quality cannot match a higher-resolution printer. The “apparent resolution” of the 360dpi greyscale printer might give comparable results to the 1,000dpi printer on photographs, but it will not match it on 4-point type. So the answer to the question “What does ‘apparent resolution’ even mean”? I hope I’ve shown that it means something – but it doesn’t mean enough to base a purchase decision on.